I know minimalism is all the rage right now, but something in me cringes when I walk into a house and see stark white walls and no art anywhere. Maybe it’s the artist in me talking, but there’s something about wall art that makes a space more cozy and warm. Enter the gallery wall. I’m a big fan. Not many of us can afford huge paintings that fill a wall, so gallery walls can be a great way to bring a little life to a space with a collection of smaller meaningful pictures. But then there’s the problem of making a tasteful gallery wall without making a room feel cluttered. It’s all about balance, people. Not to mention the bajillion nail holes in the wall in the aftermath. Well, you’ve come to the right place. I’ve made a list of gallery wall options I’ve incorporated in my home as well as a round up of gallery wall ideas from some other talented ladies from around the web. This idea just might be my favorite. Not only do you save on nail holes and stress over whether you have the layout all right, but it never gets boring. Truth be told, I usually rotate the art pieces I have for sale on this shelf and it’s not always styled perfectly, but that’s part of the appeal. It’s so simple, but it does such a great job of brightening up a wall. Here’s another idea that requires no nail pounding and keeps a fresh look in any space because you can easily switch it out whenever you want. Tastefully layer with books, pottery, and meaningful photos, and you’re set. This idea is one I’m pretty proud of. I just picked up some clipboards from the Dollar Tree (I mean, you can’t get much cheaper that $1 a pop), and spruced them up a little before hanging them up. This arrangement has the added bonus of being practical because you can switch out to-do lists, meal plans, calendars, or whatever you want. I found some beautiful free printables that I used to decorate my clipboards and balance out the boring practical stuff. The geometric art is from Keystone Inspiration, the quotes are from Faithful with the Little, and the flower coloring page is from Polina Bright Art. I love the idea of pictures creating a symmetrical gallery wall, but I lack the patience to measure and balance the frames so they line up perfectly. 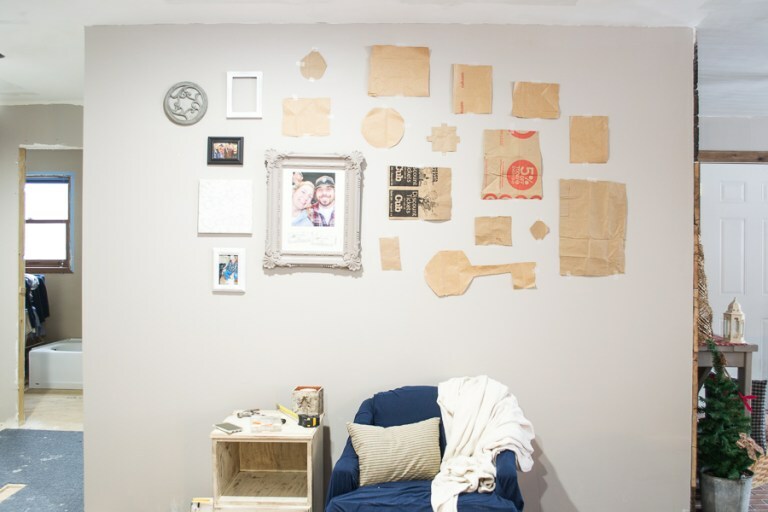 Rochelle over at Five Marigolds created a sweet example of a way to do this in a boy’s room. Plus, check out that amazing blue dresser. This might be the most obvious option for gallery walls, but it’s still a great solution to bare walls. I love to mix and match artwork with signs, photographs, cross stitch art, and other hangable items to add a little dimension and variety. If you’re looking for more ways to brighten up a space with wall art, here’s a roundup of amazing gallery wall ideas from around the web to get your juices flowing. And of course, if you’re ever looking for pieces to add to a collection, I’ve got you covered at my art shop. I love the sweetness and simplicity of this quote wall. Here’s great way to mix and match different pieces to make an asymmetrical art wall. If you’re looking to avoid excess nail holes, try this strategy. I love the idea of a pegboard wall so you can change out art easily. So, can we all agree it’s time to add a little color to those bare walls with some creative art displays? Let’s get on it! Like what you read? Hop on over to the sidebar and subscribe to receive an email every time a new post comes out. And I’d be eternally grateful if you click on a button below to share the love. Image | This entry was posted in All Things Art Related, Lists, Tips, and Ideas, The Creative Life and tagged banner art, clipboard wall art, floating shelf art, gallery wall ideas, gallery wall roundup, home decor blogger, home decor ideas, how to create a gallery wall, pegboard wall art, quote wall, wall art ideas, wall hangings. Bookmark the permalink. I love all of the ideas! Thanks for sharing! Glad you found a couple of ideas you like. I love my clipboard wall! I love these ideas! I’m moving into my new apartment this weekend so I’m definitely looking for ideas. I might do the inspirational wall! Good luck with the move! A fresh start is always great when it comes to design and decor. Have fun adding art to the walls! I LOVE a beautiful gallery wall! These are great ideas for wall layouts.